Chart No. 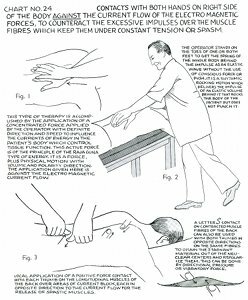 24 - Contacts with Both Hands on Right Side of the Body Against the Current Flow of the Electro Magnetic [Electromagnetic] Forces, to Counteract the Excessive Impulses Over the Muscle Fibres [Fibers] Which Keep Them Under Constant Tension or Spasm. 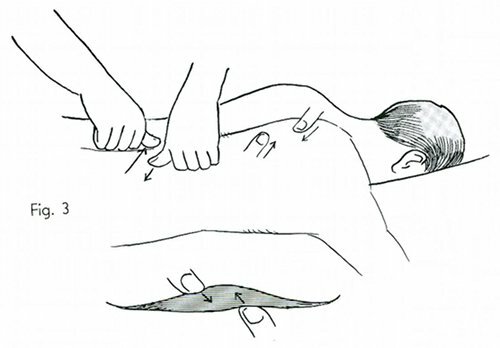 This type of therapy is accomplished by the application of a concentrated force applied by the operator with definite direction and speed to influence the currents of energy in the patient's body which control tissue function. This active force is of the principle of the raja [rajas] guna type of energy. It is a force, plus physical motion with volume and polarity direction. The application given here is against the electro magnetic [electromagnetic] current flow. The operator stands on the toes of one or both feet to get the spring of the whole body behind the impulse as an elastic wave without the use of conscious force or push. 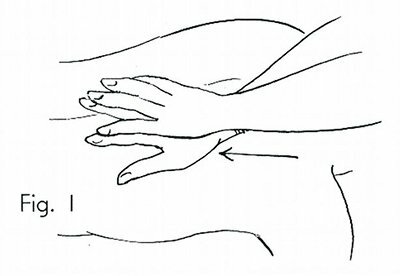 It is a rhythmic rocking motion which delivers the impulse of an elastic volume behind it that rocks the body of the patient but does not punch it. 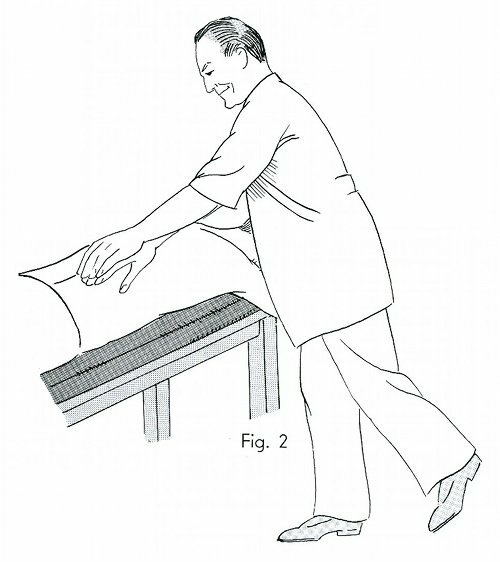 Local application of a positive force contact with each thumb on the longitudinal muscles of the back over areas of current block, each in opposite direction to the current flow for the release of spastic muscles. 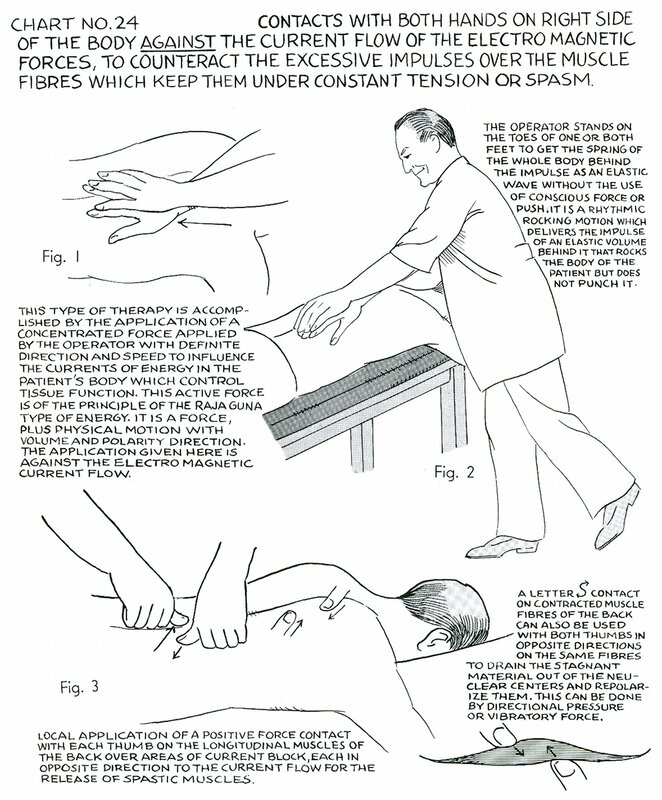 A letter 'S' contact on contracted muscle fibres [fibers] of the back can also be used with both thumbs in opposite directions on the same fibres [fibers] to drain the stagnant material out of the neuclear [nuclear] centers and repolarize them. This can be done by directional pressure or vibratory force.